The migrant corpses and survivors were transferred to rescue vessels from at least 11 overcrowded boats off the Libyan coast amid calm seas. ROME: Rescuers recovered eight bodies and saved 1,400 migrants trying to cross the Mediterranean from North Africa to Europe by boat, Italian coastguard said on Tuesday. The migrant corpses and survivors were transferred to rescue vessels from at least 11 overcrowded boats off the Libyan coast amid calm seas, according to coastguard. One migrant who had a heart attack and two suffering from severe hypothermia were taken to hospital by helicopter. 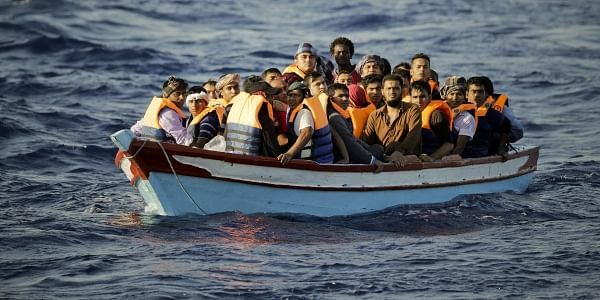 The coast guard ship Diciotti took seven corpses from a rubber boat, while one body was recovered from another rubber vessel by the Topaz, a ship run by humanitarian group Migrant Offshore Aid Station (MOAS). The migrant vessels included one wooden trawler that was carrying 450-500 people as well as two smaller wooden boats and several overcrowded inflatable dinghies, the Red Cross said. The survivors included migrants from Syria, the Palestinian territories, Lebanon and sub-Saharan Africa.